I hope you all like! Ryuko Matoi belongs to Kill la Kill, which belongs to Trigger. 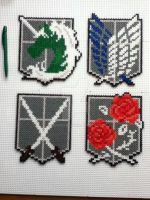 I never saw anything made out of Perler beads before! I'm impressed! Let's go on a date, Ryuko!